When I was about 10 years old my mother brought home a family tree that a relative (Bruno Cohn who later went by Bruce Carter) had gotten out of Germany, taken with him to South America, and later brought to Los Angeles when he immigrated to the U.S. 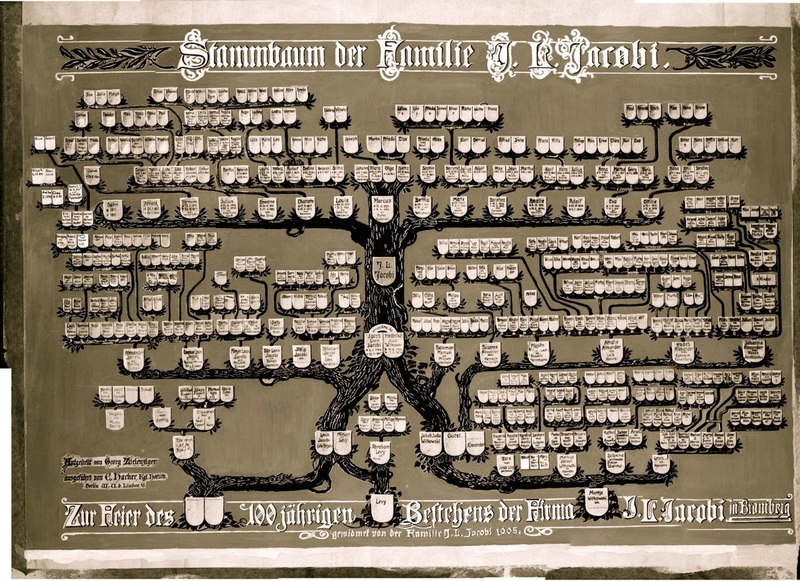 The Family Tree was drawn in 1905 and is centered around the marriage of Jakob Jacobi and Friederike Witkowski, which took place in 1810. The tree was drawn in commemoration of the 100th year anniversary of the founding of the company, J. L. Jacobi, in the city of Bromberg. Many of the family members on the tree lived in Bromberg, or were born there. Bromberg was in Germany until WWII; it is now in Poland and is called Bydgoszcz. It lies about halfway between Berlin and Warsaw (see map HERE). The lower left side of the tree is Jakob’s family (JACOBI), while the lower right side is Friederike’s family (WITKOWSKI) with her “step-family” (ALEXANDER) above that. The top part of the tree are the descendants of Jakob and Friederike. My mother later restored and updated the family tree. For an overview of the different branches click HERE. To see an enlarged version of the tree (where you can actually read the names on it) click HERE. Click here for HOME page. Click here for INDEX.